I used props from around the house to pull this together, and used some Lawn Fawn dies to add some fun, crafty touches. I rolled red fondant into little apple balls and placed a toothpick stem and die-cut leaf to make an easy cupcake topper! 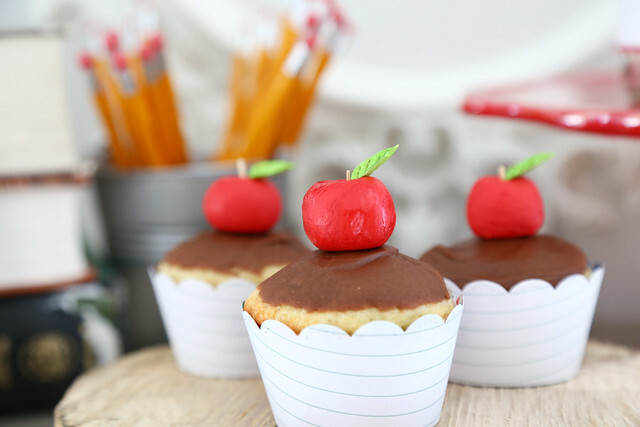 The school-lined paper cupcake wrapper adds to the look. 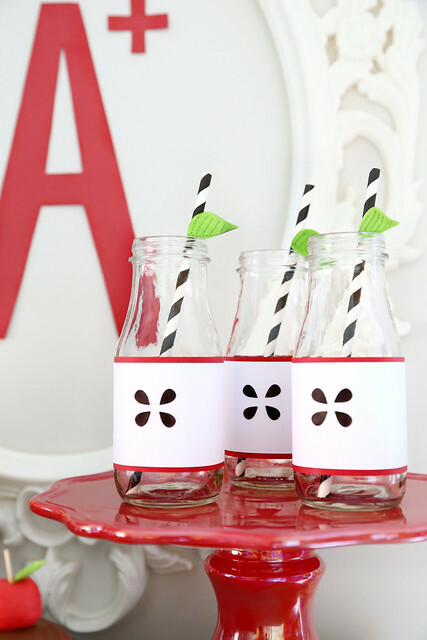 These decorated milk bottles are my fave! They look like cut apples, thanks to the little raindrop-turned-seeds die (from Spring Showers.) I also added a stitched leaf to each straw, which adds a nice pop of color! 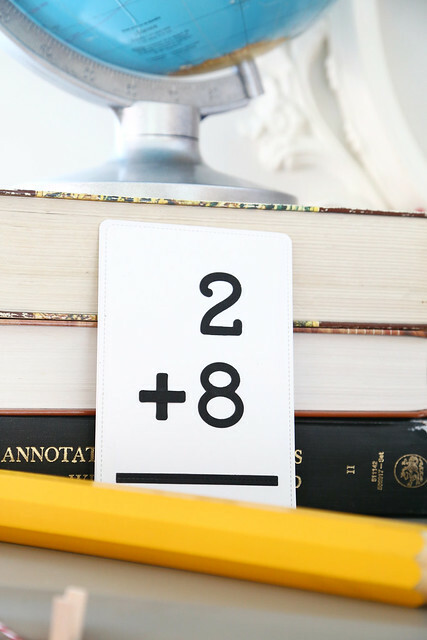 I made a flash-card banner, using Louie's 123s and the Large Stitched Journaling Card. To make the plus signs, I just cut my own strips of paper and adhered them together. 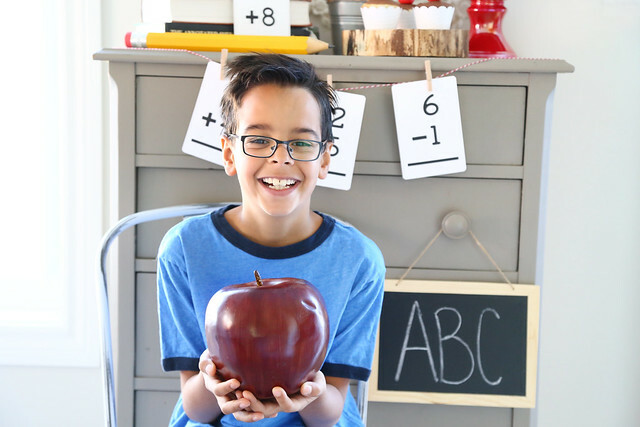 Thomas begins grade 4. This kid is a munchkin. I want to ruffle his hair and straighten his glasses. Always. 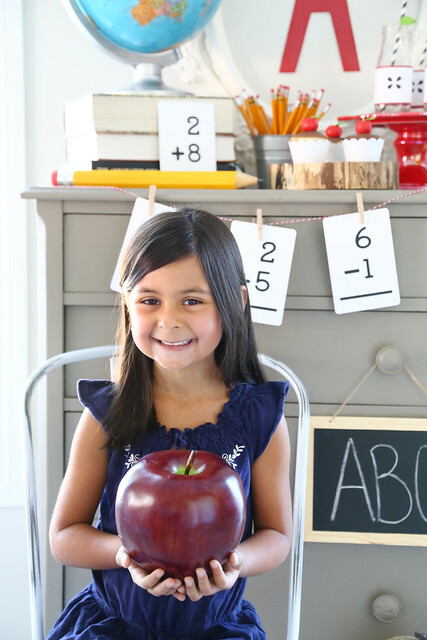 Maia is a bundle of excited nerves for today - she's always apprehensive to start something new, but she gets a real desk in grade 1! 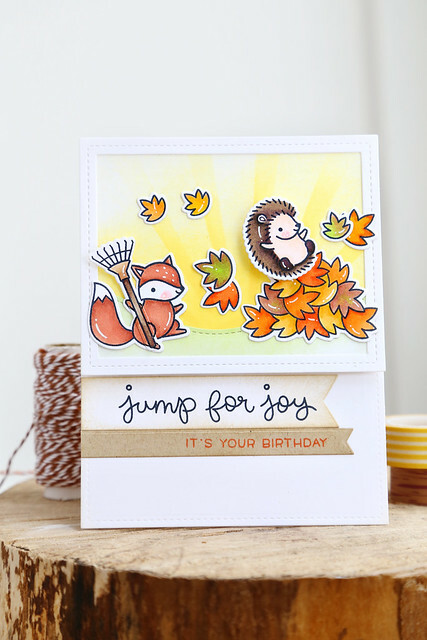 Hi there, and welcome back to our final day of Lawn Fawn's August inspiration week. Do you know what that means? The entire fall/winter release becomes available TOMORROW. woo hoo! The design team is going out in style, with everyone using the new Everyday Pop-Ups and Stitched Hillside Pop-Up dies to create fancy cards. 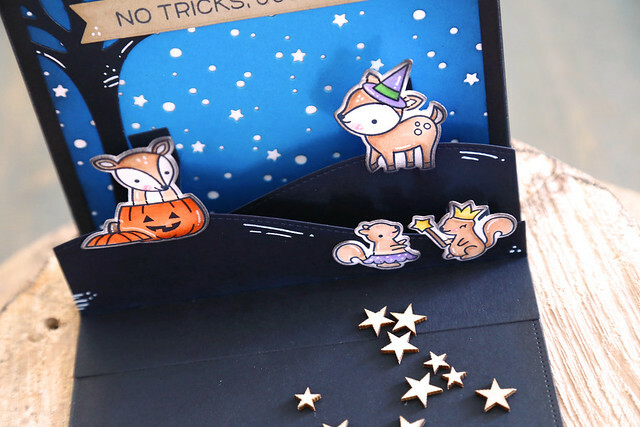 The Toboggan Together reindeer met up with his friends from the new Cheery Christmas set for Halloween! I love that the little tutus and other accessories can fit on other critters! I cut a starry night sky out of blue paper, and then rubbed our Deep Sea ink around the edges to give it more depth. 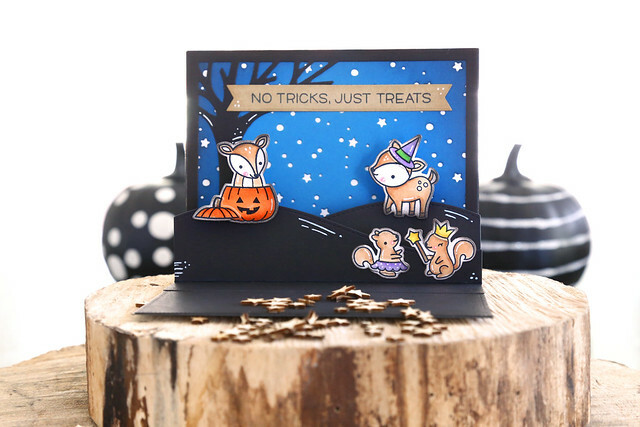 A little tip: the contrast of the white border around each die-cut was too jarring next to the dark hillsides and dark blue sky so I inked around the edges of each critter to make everything blend better. I also lightened up the heavy black elements with the help of a white gel pen. It helped create balance between the light and dark elements. 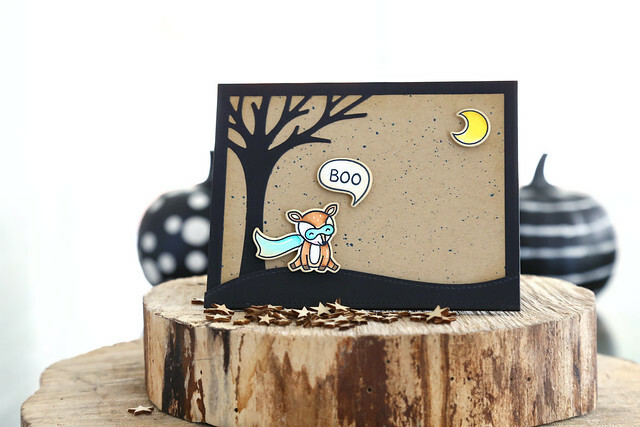 Visit the LF blog for so many more pop-up cards! Hi there! I'm back with Avery Elle for a closer look at the new falling snow die. 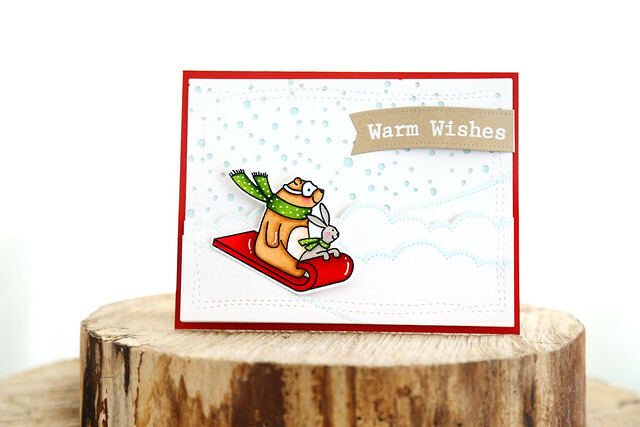 I used the sledding critters from Snow Much Fun as the only real pop of color on my card-front. Aren't they adorable? The goggles are the bear are too much. 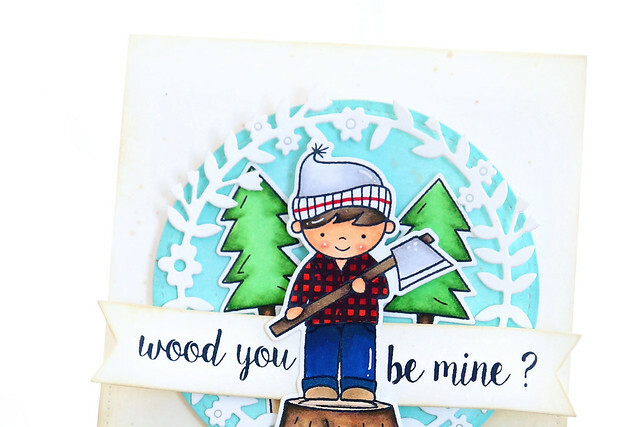 For the background, I used the Falling Snow die and layered a light blue cardstock behind it so that it would show more. Can we talk about the genius of that die? The irregular snow circles are amazing, and you can use it to die-cut a strip of snow, or a full sheet - with no weird overlap. I will be using it again and again for Christmas cards and tags this year. It's a must-have. I used cloud border dies to mimic the mounds of snow everywhere. It looks like Montreal in the winter, for sure! 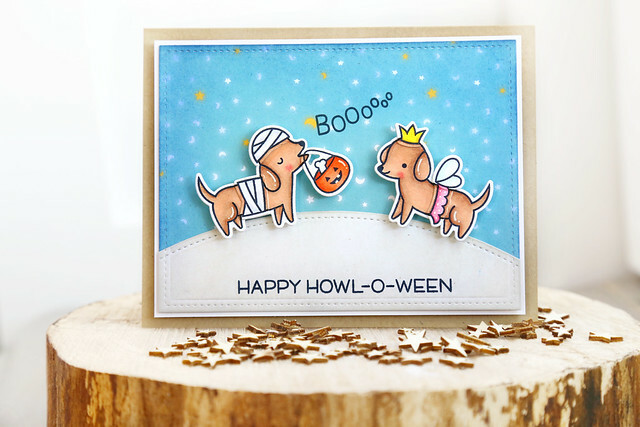 I'm back with the Lawn Fawn team, highlighting the mini set, Cutie Pie. I created a little scene in between 2 strips of plaid patterned paper. The little squirrels from Cheery Christmas are holding up a little banner in front of the pie. Lawn Fawn's August inspiration week continues, with all new products becoming available in just 3 more days! 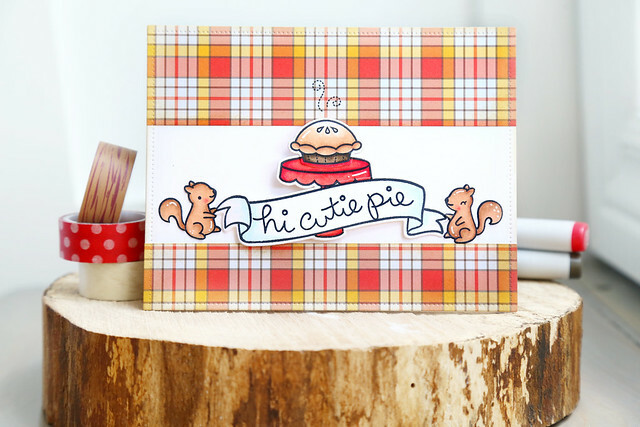 Today, we're showing off the plaid papers for fall - they are so cozy and warm looking! 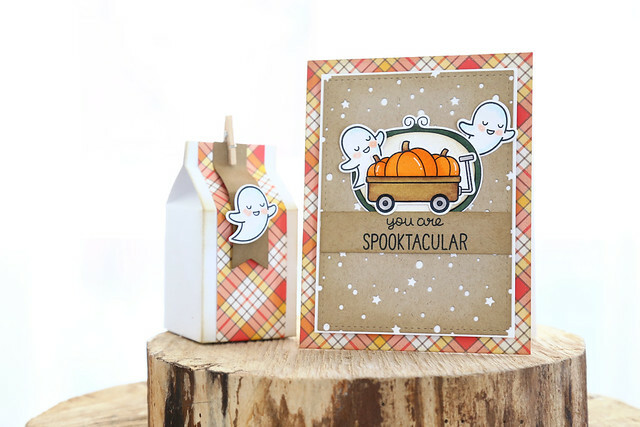 I made a little card and favor box combo for Halloween using some favorite older sets, and combined them with a new plaid paper. The colors I used for the images are all found in the plaid, which makes everything come together. Hi there! Lawn Fawn inspiration week continues with a look at my favorite gift packaging die yet, the Scalloped Treat Box. 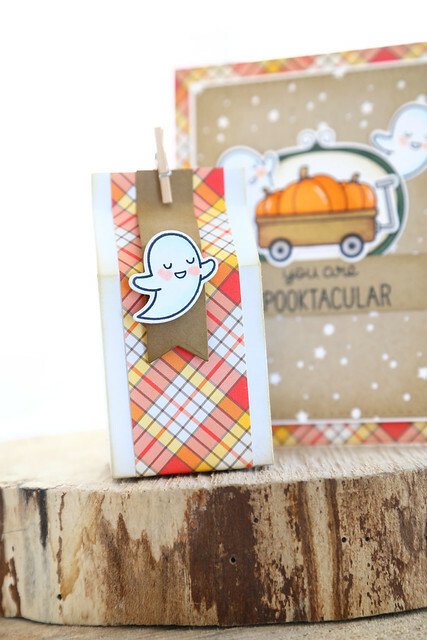 I dressed up the box with a strip of plaid paper from the Perfectly Plaid Fall collection. I ran my strip through the die-cutter so that it would have the same stitched edge at the top. 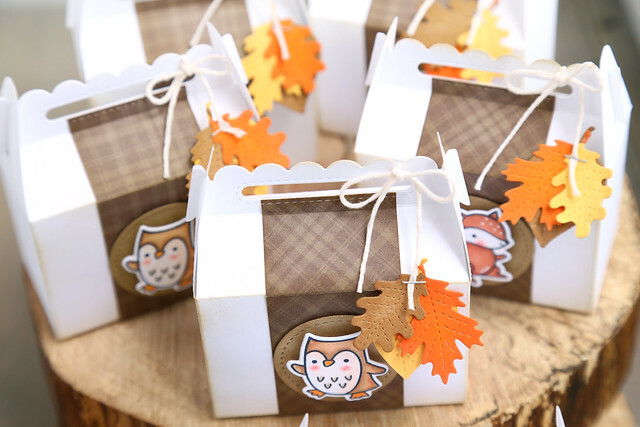 It's a fun way to dress up your boxes if you don't want to use up too much of your patterned paper. 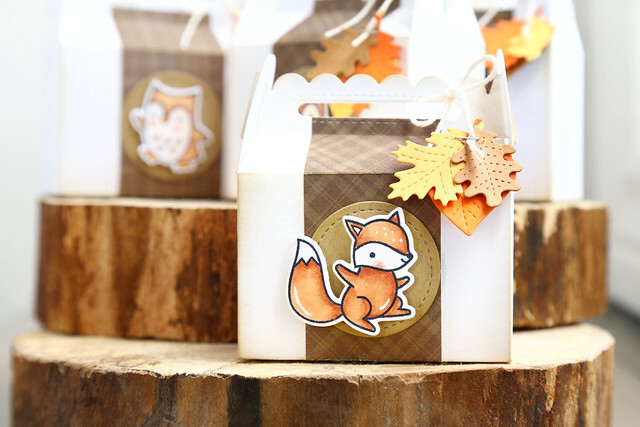 The boxes feature either the fox or the owl from Jump For Joy, and a trio of stitched leaves hanging by some plain twine. 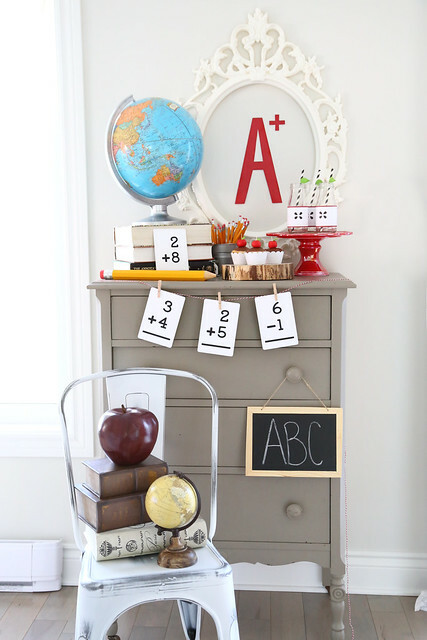 Hi there, and welcome back to another day of Lawn Fawn's August inspiration week! 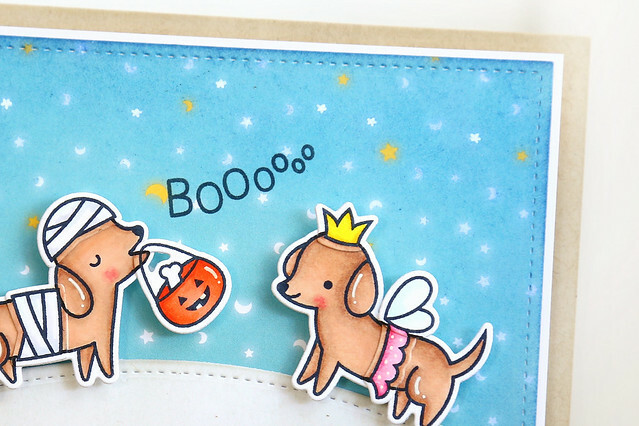 We're showing off our best hallowieners today - Happy Howloween is an amazing dog-themed Halloween set, where you can dress up your pups in all sorts of cute costumes. I kept my scene simple and cute, with the male pup handing over his Halloween winnings to his lady friend. Right? I'm still a huge fan of using a black copic-friendly pen to fill in the lines once the die-cuts are in place. The images look so much more seamless like this! Without adding the black lines and coloring the white spaces, you wouldn't be able to tell that the bucket strap is in the dog's mouth. It would just look like it's resting on top. It's an extra step that take hardly any time, but makes a huge difference! 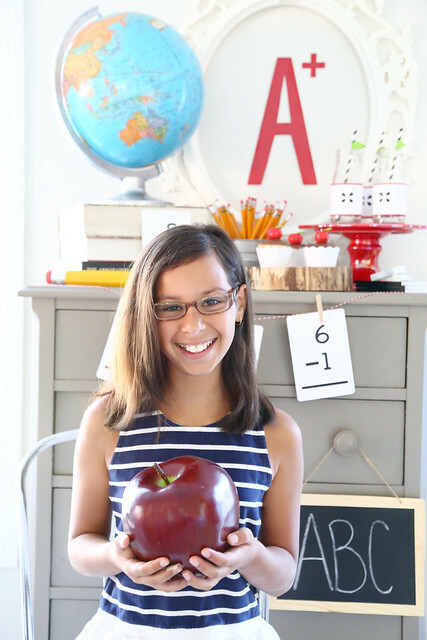 I hope you like it - there's way more to see on the LF blog this morning - click! Lawn Fawn August inspiration week! At the end of this week, all of Lawn Fawn's fall/winter products will be available for purchase! You can find more details on the original blog post - click! 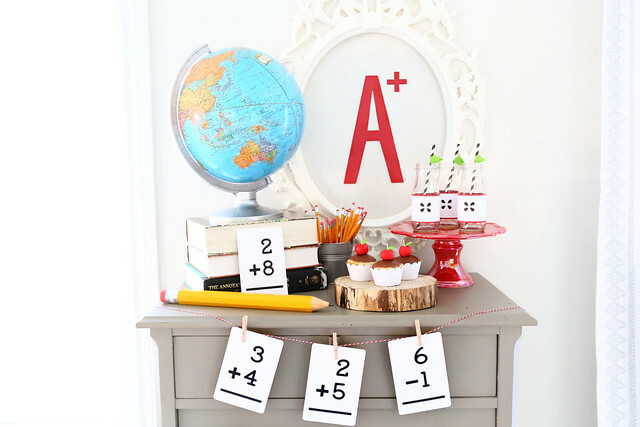 And check out the Lawn Fawn blog this morning for so many amazing design team projects - click! 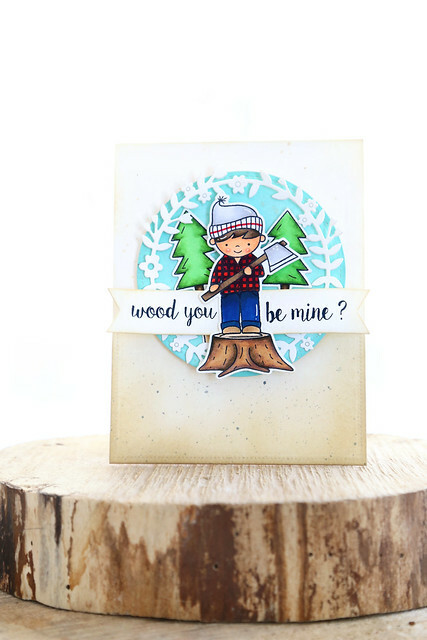 I'm here and on the NT blog this morning, with a card that mixes a little fantastic something from our newest release, with a more vintage Neat and Tangled set. I really can't wait to use this little guy on some holiday cards! But it's still too hot outside. In the meantime, I rubbed some blue ink (Mermaid, from Lawn Fawn) onto a circle die-cut to make sure everything in front of it would pop. The bottom half of the card was colorblocked by rubbing a soft brown ink over a separate panel, and splattering it with grey ink. Neat and Tangled turns 4! 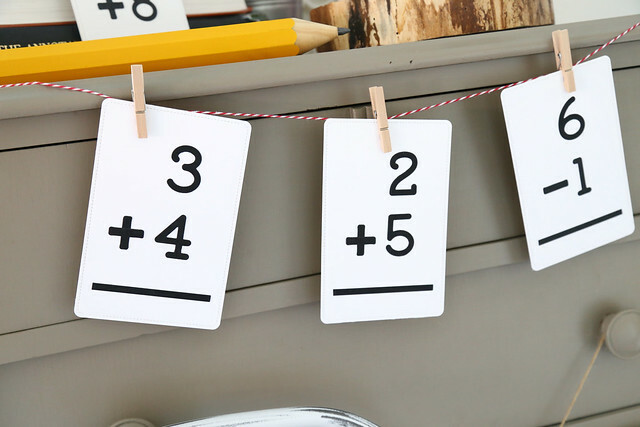 It's day 4 of Neat and Tangled 4th birthday blog hop celebration - have you been tuning in so far? 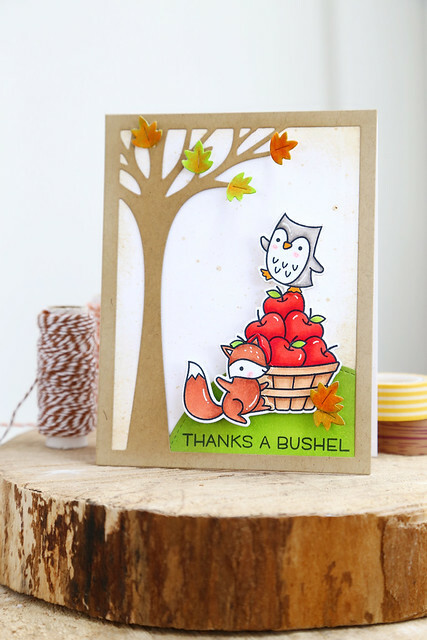 I created this card for the occasion, using my new stamp set Little Stinker. It's in the NT store right now. Did you see that watercolored background? It's watercoloring for dummies. If that's a club, I'm the president. I have no clue what I'm doing, but I used a new-to-me product from Cosmo Cricket and it's a game changer. It's called Pixie Paints, and I used the Candy color here. Check it out - click! And don't forget to go by the NT blog this morning - there are amazing prizes up for grabs and an all-star lineup every day of the hop! My kids all have their birthdays within the same 10 days, at the end of April/beginning of May. I'm usually sweating my way through 3 birthday party weekends, and in a sugar coma at the end of it all. This year, my sweet Thomas turned 9 and asked for a party in the summer so he could play outside with his friends. "Outside" and "later" were the 2 most beautiful words I had ever heard. 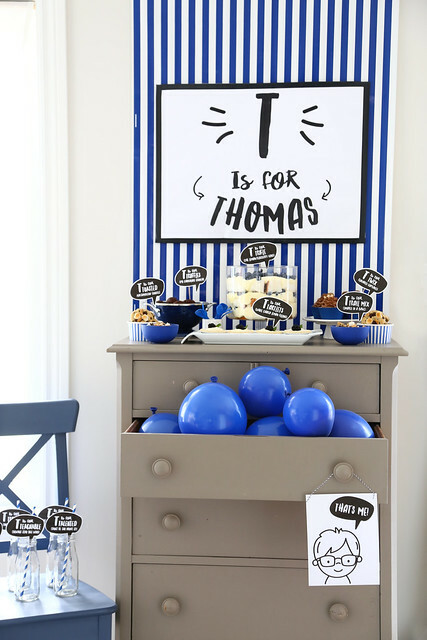 We usually do properly themed parties, but Thomas said he just wanted the party to be "all about me." I printed up an 18x24 inch poster (on engineering print paper, it costed just a few dollars at Staples,) mounted it to a foam core board and framed it out with electrical tape. That poster, and a roll of striped wrapping paper was all I needed for a striking backdrop. The rest of the photos are just close-ups of the desserts, haha. 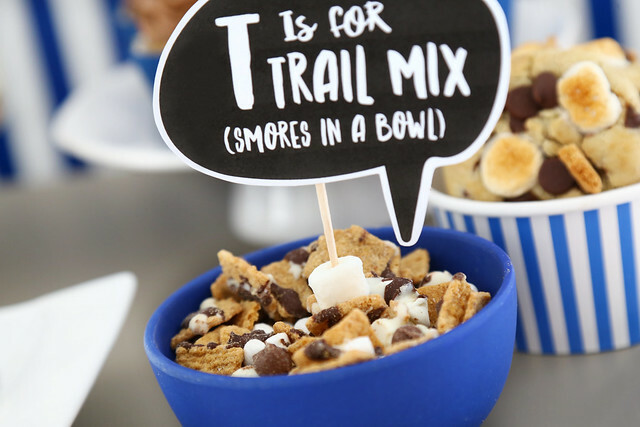 Every treat started with the letter T, to carry our little theme. These peanut butter balls had graham crackers in them for a bit of crunch. They were delicious! You can make them for yourself: click! I was so excited to have an excuse to buy a trifle bowl! I love all the pretty layers. 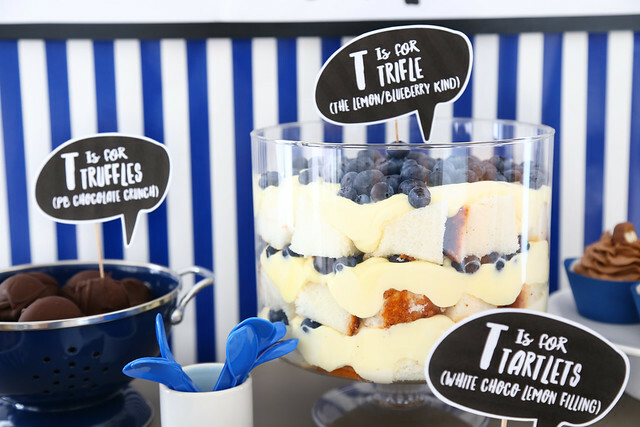 We did a lemon pudding with angel food cake and blueberries. I am still sneaking bites from the fridge, it is so good. 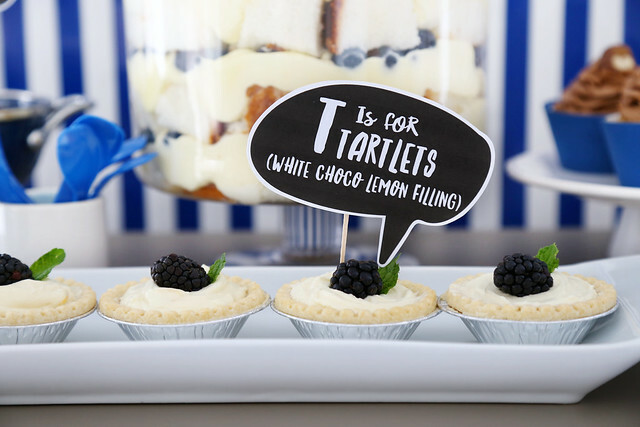 These little tartlets looked so elegant! 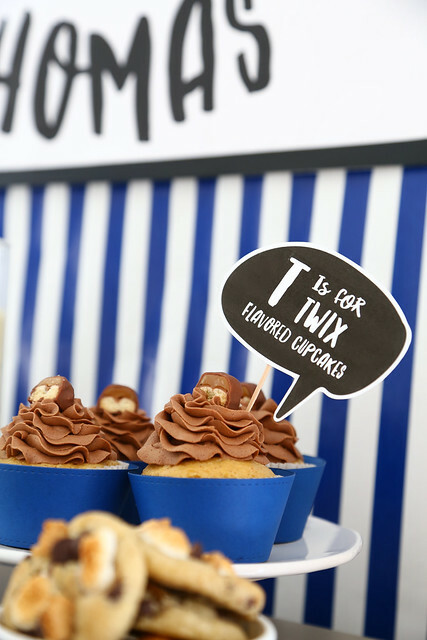 Vanilla cupcakes, injected with caramel sauce and a chocolate frosting to top it off = twix cupcakes. There were none left over. 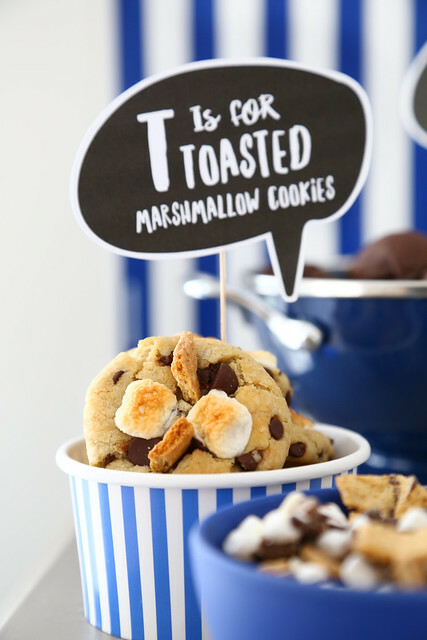 My favorite dessert hands down were these s'mores cookies. 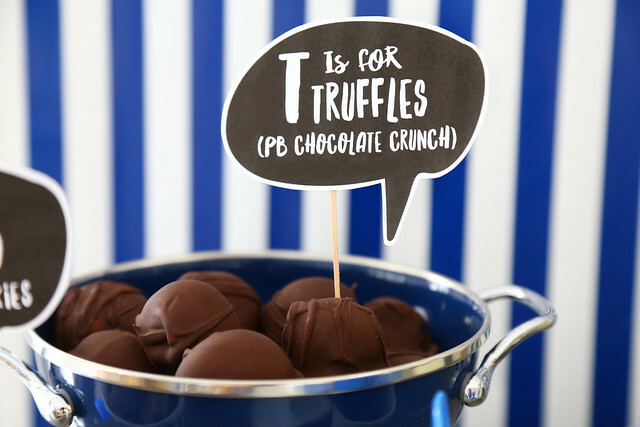 Honestly, so chewy and yummy and you'll want the recipe: click! I don't have a kitchen torch, so I turned on the broiler at the end of the cooking time to toast those marshmallows. I hope you liked this simple party spread! It was so fun and easy to put together, and Thomas felt like a star. 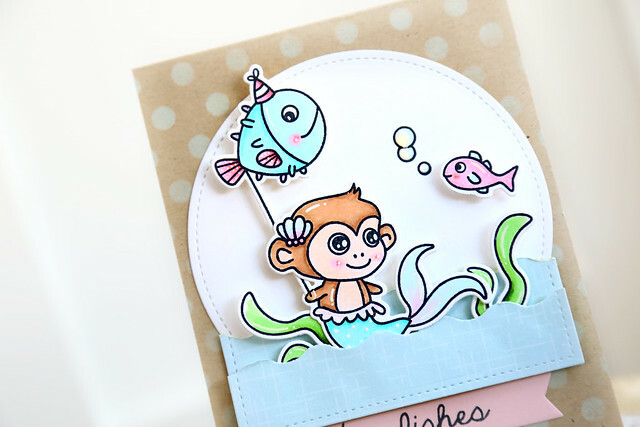 I'm here and on the Waffle Flower blog this morning, with a set of fun cards featuring Little Mermaids. 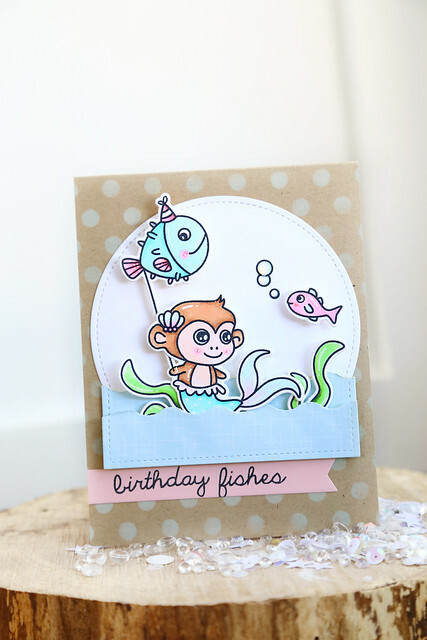 My first card combines Little Mermaids with Birthday Fishes. The little fish checking out the fish balloon cracks me right up. My next card shows off both monkey mermaids. The one on the left is sporting a hair jewel that I thought was a perfect match for the swooping edges of the Doily Square Die. Especially when I colored in the little pink drops. They look like jewels all around the die-cut frame! I hope you have a pearl-fect day! Thanks for stopping by! I am starting to get inky again, after taking a break for a few weeks. It feels strange, and wonderful. I am so rusty! 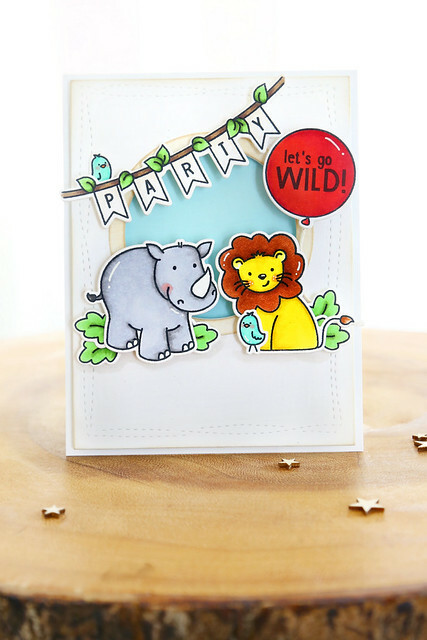 I love these cute little safari animals - they are so fun to color! I stamped a p-a-r-t-y banner and the rest of the sentiment, I popped into the balloon. They look too innocent to know what WILD means. ha.